Last week we were excited to see Astrid Krogh’s latest works at the vernissage of her exhibition, ‘Sky’ at Maria Wettergren’s gallery. We were lucky enough to talk to the artist who explained that her inspiration is natural and artificial light and the dialogue between the two. 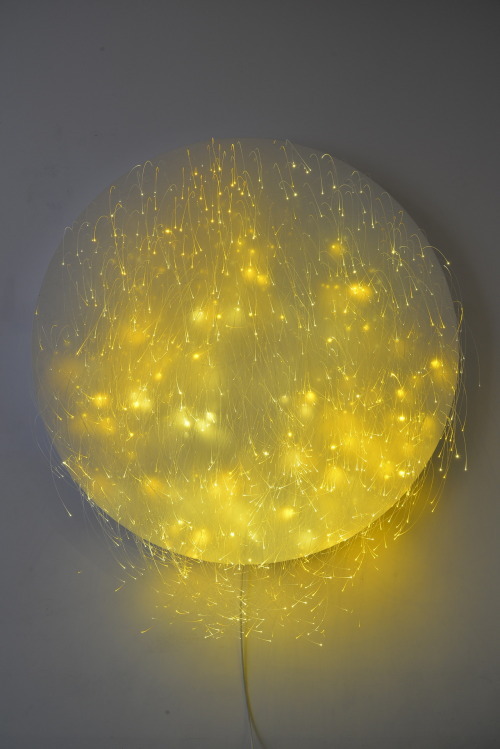 This stunning piece, ‘Mare Tranquilitatis’ is an optic fibre installation which takes its inspiration from a lunar mare situated within the Tranquilitatis basin on the moon. The fibres gradually and subtly change color creating an everchanging and hypnotic landscape while the light reflections on the circular dish lead the eye back to create another dimension. Truly a statement piece!